MOSCOW --- The US Navy’s missile strike against Syrian air base Al-Shayrat has prompted vigorous discussion in Russian and foreign media, focused mostly on the socio-political or military-political aspects of US President Donald Trump’s decision to attack the Syrian air base with BGM-109 Tomahawk sea-launched cruise missiles (SLCM) and on the consequences of the attack for international politics. 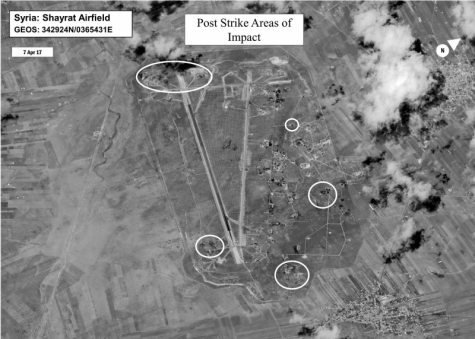 However, the discussion has virtually overlooked the military-technical aspect of the massive cruise missile strike, all the more so that the number of missiles spent on a tactical airfield like Al-Shayrat is regarded as unprecedented - 59. The US Navy has not lobbed so many missiles on a single target yet, expert Nikolai Novichkov, Ph.D. (Engineering), writes in the pages of the Military-Industrial Courier Weekly. Experts presume the strike was a deliberate muscle flexing aimed not so much at Syria as Russia. "In political terms, the attack on the Syrian air base without warning the Russian side in advance is to demonstrate to Moscow what can be done to our task force in Syria in case of a direct Russian-US military conflict in the region. Naturally, the number of missiles to be launched by four to five ships will increase to 100-150 or more. This will enable the Americans, after proper preparations, to destroy all of Khmeimim AB’s air defense (AD) assets and the base itself with all Russian aircraft deployed there," military expert Konstantin Sivkov writes in an article with the Military-Industrial Courier Weekly. The Russian Defense Ministry says 23 out of 59 (39%) Tomahawk Land Attack Missiles (TLAM) launched by the Arleigh Burke-class guided missile destroyers USS Ross (DDG-71) and USS Porter (DDG-78) made it to the Syrian Air Force’s Al-Shayrat AB in the province of Homs. In spite of the denial of the reports by Pentagon sources insisting that 58 out of 59 missiles (98%) hit their targets, the Russian military regards the tactical effectiveness of the US missile strike as extremely low. Without going into detail assessing the tactical effectiveness of the TLAM during the Al-Shayrat attack, which calls for scrutiny, let us consider Sivkov’s statement "the Americans, after proper preparations, can destroy all of Khmeimim AB’s air defense assets and the base itself with all Russian aircraft deployed there." Indeed, what were the S-400 Triumph (NATO reporting name: SA-21 Growler) surface-to-air missile (SAM) battalion at Khmeimim AB and the S-300V4 (SA-23 Gladiator/Giant) SAM battery at Tartus Naval Base covered by units of Pantsir (SA-22 Greyhound) anti-air gun/missile systems doing on the night of April 7, when the massive missile strike against Al-Shayrat was in progress? All the more so that the Pentagon had warned the commander of the Russian force in Syria of the upcoming attack two hours in advance. The Russian military leadership has not commented on this, which makes sense, in fact. Presumably, if the Russian AD assets in Syria did not go ‘weapons free’ due to the lack of Moscow’s military-political decision to intercept the attacking Tomahawks (which is quite logical), our military nonetheless managed to glean as much useful intel as possible from the missile strike. There are almost 3,500 Tomahawks in the US Navy’s inventory now. Mostly, they are RGM/UGM-109E Block 4 Tactical Tomahawks (TLAM-E). Today, the fourth-generation Tomahawks are the baseline model of the type in service with the US Navy. The two guided missile destroyers sitting south of Crete launched the TLAMs. The ships are based at Spanish naval base Rota under the NATO BMD program and operate within the US Sixth Fleet’s area of operations in the Mediterranean. The range to Al-Shayrat from the launch site was about 1,200 km, with the Tomahawks flying ‘feet wet’ almost all of the time and only 75-80 km ‘feet dry’. The Tomahawk SLCM has a combined guidance system. It is guided over the sea by the inertial navigation system (INS) with an error of about 800 m per flight hour. Once the shoreline is crossed, the terrain contour matching (TERCOM) system kicks in, correcting the propagation error when passing the waypoints. INS and TERCOM are mated with the GPS navigation system, in which the target grids are entered. GPS can directly correct INS, which at times makes the preparing a flight mission data for TERCOM based on digital maps unnecessary. There also is the Digital Scene Matching Area Correlation guidance system for the terminal leg of flight, comparing the actual target area against the program uploaded to the weapon’s computer prior to launch. Since the decision to employ Tomahawks had been made made in the timeframe required to prepare the mission input data for their TERCOM system and since the missiles had covered relatively short distance over land after crossing the shoreline, one can presume they were being cued to the targets at Al-Shayrat AB by only INS corrected by GPS. Obviously, the optimal route to Al-Shayrat in Homs province past the shoreline could initially run through the southern part of the coastal plain stretching as a narrow line along the Syrian coast. Between the coastal plain and the valley of the Al-Asi (Orontes) River, there is the Al-Nusayriyah Mountain Range running parallel to the sea coast from the Turkish border in the north almost to the Lebanese border in the south and measuring about 65 km wide and around 1,200 m high. Since there is a mountain passage known as the Homs Gap between the southern tip of Al-Nusayriyah and the northern end of the Anti-Lebanon Mountains (Jibal Lubnan al-Sharqiyyah), it is possible that the US cruise missiles sneaked into Syrian airspace toward Al-Shayrat right through it, having passed via the area of the Russian Navy’s 720th Logistic Base in Tartus, covered by S-300V4 SAM systems. According to the video footage released by the US Navy, the USS Porter launched her Tomahawks from her bow and stern modules accommodating Mk 41 vertical launch systems (VLS). The missiles left their VLS at 13-14-second intervals and, once their solid-propellant boosters were jettisoned at an altitude of 250-300 m, followed the cruise leg of their flight path at an altitude of about 100 m above the sea. Since there is no information on the synchronization of the TLAM launches by the destroyers, it is hard to say whether missiles bunched up into packs after launch or not. However, if the destroyers synchronized their launches, almost 30 pairs of Tomahawks headed for Al-Shayrat at the same time, with the interval between the first and last pairs accounting for around 7 min. If the USS Porter and USS Ross fired the missiles in a consecutive manner, the interval could be 14 min. This dovetails with the information provided by the Russian Defense Ministry. On the day of the attack, Russian Defense Ministry Spokesman Major General Igor Konashenkov said that the missiles had been launched between 0342 hrs and 0356 hrs Moscow time. Obviously, the Russian SAM systems deployed on the Syrian coast were unable to detect the Tomahawk launches from the vicinity of Crete 1,100 km away, all the more so that the radar cross-section of the TLAM is about 0.1 sq.m. However, the radars of the S-300V4s should have acquired and autotracked the Tomahawks when the latter approached Syria’s coast near the Homs Gap about 20 km away from Tartus. Never before, not at any exercise or missile range have the Russian crews of cutting-edge AD weapons systems had an opportunity to watch a real massive attack of Tomahawk cruise missiles, autotrack them and gage their flight parameters and radar signatures. Russian Aerospace Force commanders could only dream of such a wealth of targets that can be arranged only in virtual reality as part of computer simulation of various courses of action. To cap it all, the TLAM strike is sure to have been covered by EA-18G Growler electronic warfare (EW) aircraft off the Syrian coast and other US EW assets. Actually, the US Navy has given the Russian AD crews a kind of crash course on repulsing a massive US cruise missile attack in countermeasures-heavy environment. The crash course has cost the US Navy $89 million, according to US media estimates of the cost of the 59 missiles used, while the Russian Defense Ministry has not spent a red cent on the precious training.